Neural stem and progenitor cells are found in a well-defined region in the adult brain and spinal cord. 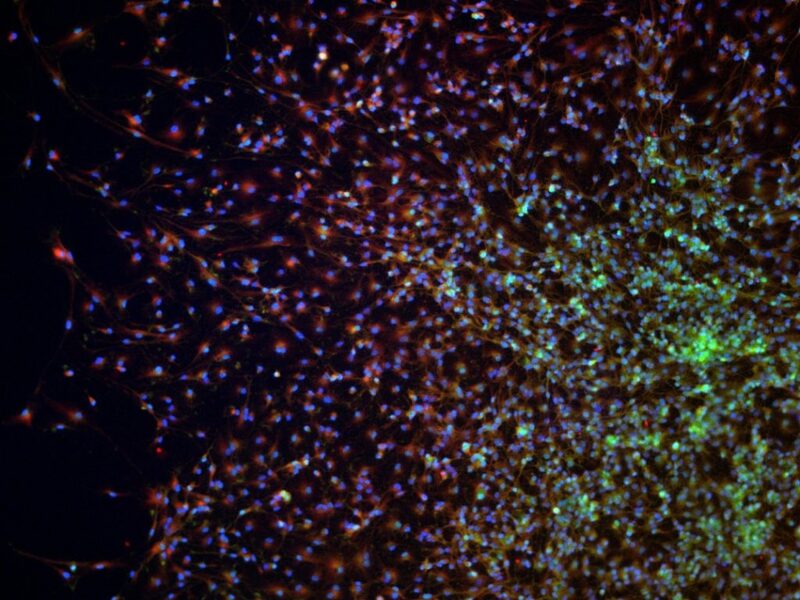 These cells have great potential for neural repair strategies. In vivo, these stem and progenitors are recruited to injury sites however, not in sufficient number for functional recovery. As such, one approach to repair the brain is to enhance the migration of these endogenous cells to the injury site where they may proliferate, release support factors and/or differentiate into functional replacement cells. Our lab and others have previously demonstrated electric fields are able to direct neural stem and progenitor cell migration in vitro. We are currently investigating the ability of electric fields to direct neural stem cell migration in vivo and its potential as a regenerative medicine tool. Immunocytochemistry of plated neural stem and progenitor cells.